New York is comforting as the Autumn advances and the fall colours stir our hearts. 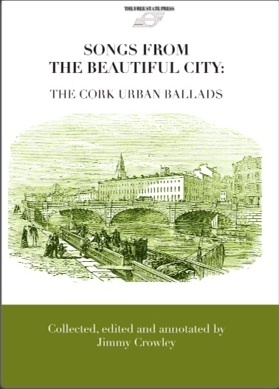 Having just returned from my New York book launch of “Songs from the Beautiful City: the Cork Urban Ballads,” I marvel again at how stimulating and energising the city is. Like, as we Cork people like to say, ‘tis not too big; Manhattan, the epicentre of the Earth in many ways, is circumnavigable on a bicycle in a short time! ‘Tis only eleven miles by about five or six; yet the halls of poetry are attended most nights; there are jazz sessions that would frighten me, folk, drama, art films,book launches and rakes of events where almost all ethnic groups are represented. True, this can be a ballix as hosts scramble for work and dollars, but once an artist has attained some street credibility and the aroma of staying-power, there’s a fertile gregarious road open and positive reaction to one’s artistic needs. One of the social highlights for the week for me was a lovely sail around Long Island Bay on my cousin, Smiley (Martin) Daly’s sloop, the good ship Nugget. The engine farted to a smokey halt before we left the mooring; the same kinda smell as a frying-pan emits without oil or fat; in fact, the same problem! But being true tars, we scoffed at such modern decoys and hauling up all canvas, sailed out magnificently into the bay with a fine following wind. A wind, God knows, that accommodated our homeward bound journey as it backed slightly to the the quarter allowing us to sail right up to our mooring without the engine. Nugget is a fine, stiff, weatherly boat, old-fashioned two inch thick fibre-glass with nice brightwork and a large sail area. The patron saint of Manhattan, singer Donie Carroll hosted me and promoted me way above the call of duty. ‘Twas the same Donie who liaised with all the essential actors who combined magnificently to make my Fall trip such a success, the US launch of my life’s work, Songs from the Beautiful City: the Cork Urban Ballads. I’m eternally grateful to the people at the Cork Association of NY, in particular Mae O’ Driscoll who promoted me and fielded the event on Sunday the 25th of October at their cosy premises in Long Island City. We were blessed by no less a personage as the Consul-General, her Excellency Barbara Jones who made a memorable speech about collecting oral history and the process of achieving. Another man whom I can never thank enough for support, acknowledgement and friendship is Mick Moloney from the Irish music dept at NYU. Mick wrote a foreword for the book, launched it at City Library in Cork and lined out a second time to launch the book and make a stimulating speech in NY. We have played quite a bit together over the years and after Mick’s address, we sang and played some of those ballads that work so well with our chosed instruments: Nil ‘na Lá, The Forty-Foot Trailer,Down Erin’s Lovely Lee,etc. Donie Carroll then joined me on stage for a few of his songs that he contributed to the book, The Night the Goat Broke Loose and the piquant Isle of Maris. Then it was time for Heather Bixler Martin to join me with her stunning fiddle playing. Heather had a special status that day as it was she, no less, who struggled with the native inflections in my singing to capture in musical annotation some one hundred and seventy odd songs in the book. Other friends took the stage, including Martin Daly who sang harmonies on some earlier songs, also included in the book and who was part of the original three-piece Stokers Lodge as well as Dan and Bonnie Milliner who have a blessed and original repertoire of traditional broadside ballads. Among other unforgettable gigs during the week was a nice house concert at musician Gabe O’ Donoghue’s house in Philadelphia which I shared with Donie Carroll and a concert at Ireland House in Greenwich Village which was hosted by my favourite “Irish” harmonica player, Don Meade, a man, like Donie and Mick, who has been so kind to me,not just for this trip but all my life! It was an honour to be asked to contribute to both Mick Moloney’s classes in NYU on no less engaging a topic as to how,in God’s name, the bouzouki entered the Irish traditional music orchestra. I lied to the students and told ‘em that that long ago, in pagan Ireland, the High King, Cathub had a beautiful daughter, Emer Foltchain. She was so lovely there were courtesans and suitors sailing up from Greece and Macedonia to try and win her hand. The king of Greece, (I continued to lie,) made an appearance himself and to strengthen his son’s hopes of winning this Gaelic charmer, he offered in dowry: the full retinue of bouzoukis from the Royal court at Athens. That meant that Greece was now bereft of bouzoukis. Now, the match was made and the High King, good enough out of him, made the Greek king a present of three sevens of the Royal Harps of Tara, an instrument still played in Greece to this day. The Irish musicians took some time to find their way around this new fretted instrument, but in time, they played beautiful barndances, airs, strathspeys as well as the usual jigs, reels and hornpipes. However, when the Vikings came several hundreds of years later, the second thing they pillaged (after the women) were the Irish bouzoukis that by now were glittering with gems of bijouterie and vertu –none of your ould gold leaf and precious stones. The norsemen cleaned out the zuke arsenal and it wasn’t until my dear friend, Johnny Moynihan took a bouzouki home from a Greek holiday in the middle sixties that they began to ‘catch on’ in Ireland again. In fact, Mick Moloney told us in class, that he was there in Dublin, on that fateful night,when musical history was made. I will be back before Christmas with another Touchline. Murach é ,go raibh Nollaig fé mhaise dhaoibh go léir, agus táim lán buíoch as ucht na tacaíóchta.